The Berner Oberland is one of the must do European ski traverses. It travels through some of the largest glaciers in the Western Alps and is considered to have some of the best ski descents and summits in Switzerland. Starting in the beautiful Interlaken area, we will use the famous Jungfrau Railway to gain the peaks and glaciers that mark the start of this exciting Swiss alpine route. The 6-day Berber Oberland ski traverse will see us summiting peaks, skiing long descents and traversing hut to hut with light packs since we will be taking advantage of the meal services in the huts. Day 1: Afternoon meeting in Interlaken to prepare for the trip and have dinner. Day 2: We start our day by ascending what is considered a pioneering masterpiece among mountain railways, the Jungfrau Railway. 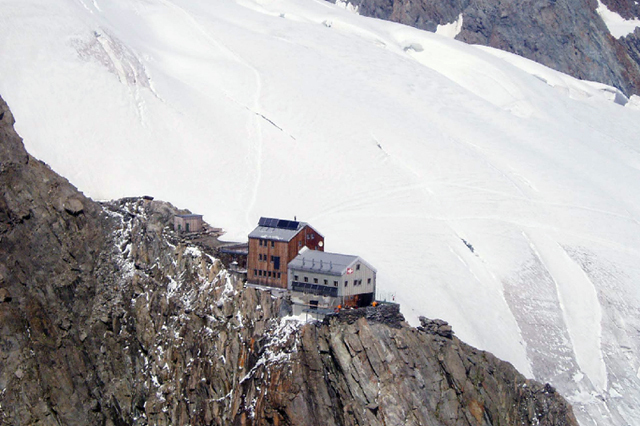 The cogwheel railway takes us to the Jungfraujoch, which at 3,454 metres is Europe’s highest-altitude railway station. Over 75% of the ride is through tunnel that weaves through the Eiger and Mönch. Once we exit the train the skiing begins! We set our sights on our first summit of the trip, the Louwitor, which provides exceptional views of the large glaciers in the area and back down into the valley. A long descent and short climb will bring us to the Hollandia hut. Day 3: As we traverse to the Konkordia Hut we have many options for peak ascents and ski descents in the area. We will choose our objective depending on the weather but expect a beautiful and challenging day in the mountains. Day 4: We will ascend from the Konkordia Hut to the Grunhornlucke, a tight pass that leads to the Fiesche Glacier below. A side trip up the Wyssnollen is possible which will allow for spectacular views and a long North Easterly descent back to the Fiesche Glacier! We finish the day by arriving at the Finsteraarhorn hut. 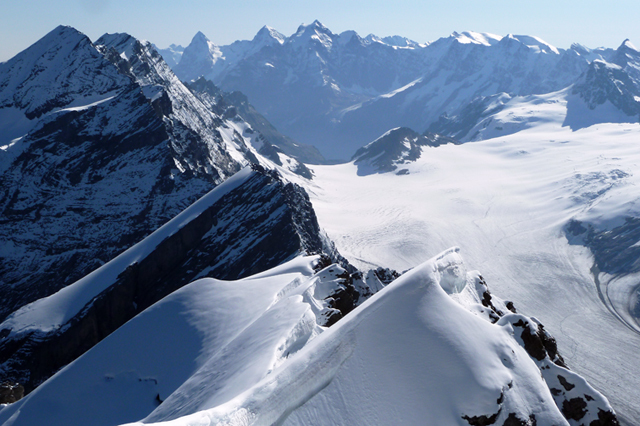 Day 5: The Fiesche Glacier area is home to many spectacular ski ascents. The objective for today will be to set our sights on one of the higher peaks in the area (nearing 4000m) while looking for the best ski quality. We will spent a second night at the Finsteraarhorn hut. Day 6: As we leave the Finsteraarhorn hut we will ski south towards the Gross Wannenhorn and ascend its North East flank for an 1100 meter descent before climbing to the Oberaarjioch hut. A long but rewarding day! Day 7: Our last day! To exit from the Oberaarjioch hut there are a few options which of course will depend on conditions. Options include high passes and long descents (up to 2000 meters!) to the valley bottom. A leisurely train ride will return us to Interlaken and the end of the trip. Your guides are certified by the internationally recognized Association of Canadian Mountain Guides. There will be a maximum of 4 participants per guide. There will be a maximum of 8 guests, minimum 4. We will meet the group at 1:00 PM on the first day at the hotel in Interlaken. Please come prepared with all of your personal gear and clothing. You will be responsible for your costs to arrive and depart Interlaken. Included in the price of the program is all transportation costs starting from Interlaken on day 2 return to Interlaken on day 7. This is a challenging program in complex terrain and as with any trip into the mountains neither weather or avalanche conditions can be guaranteed. Poor weather or avalanche conditions may require a change to the itinerary. Regardless expect the trip to be a great adventure in a beautiful area. You will need to bring adequate clothing and equipment for a backcountry ski traverse. Yamnuksa will supply group equipment and can provide certain pieces of technical equipment (harness, transceiver etc.) if required. Please see the list below. We suggest bringing light clothing of varying thicknesses that can be ‘layered’ to achieve comfort and versatility. The most important consideration for clothing is the ability to regulate temperature as you change from periods of activity to periods of rest and from the ascent to the descent. Please book as early as practical to avoid disappointment. We require a 35% deposit at time of booking. Please ensure that you have appropriate travel insurance. $3495 CDN includes certified guide, local transfers, breakfasts and dinners, accommodations Day 1 to Day 7 and basic lift passes on route. There is no GST on this program. Not included in this program is transportation to and from Interlaken. As well, you will be responsible for your own lunches, drinking water and alcoholic beverages on the trip which can be purchased on route from the huts or villages. Additional cost involved for program changes due to weather or conditions are also not provided. If you would like assistance booking accommodations pre and post trip please let us know and we would be happy to assist you. This is a challenging trip with multiple days of touring in a row. There are days of ascent over 1400m (4500ft) and you should be comfortable skiing with a pack (20-25lbs/9-11 kg) on most terrain in variable conditions. This would be suitable for people who have completed the Wapta Traverse, Bow/Yoho Advanced ski week, a lodged based touring week or similar. Understanding the prerequisites should help with your training throughout the winter. Winter ski tours and walks with a 20-25lb pack is recommended as the best training, however other activities such as cross country skiing and hiking can also be good training. Please read the itinerary and difficulty sections and be both physically and mentally prepared for the trip. If you are uncertain about your experience level, please call us.